First published in Onya Magazine, on April 8th, 2011. Welcome to Melbourne, Paul. How does it feel to be performing at the Melbourne International Comedy Festival? It’s marvellous. I’m renting a lovely 15th-storey apartment with panoramic views of inherently lonely businessmen. I love ‘Letters and Numbers’, your down-trodden version of Countdown, and I like smiling at people on the tram every day; it’s like London in the 1880s really, but with more laughter and more obvious homosexuals. How did you break into comedy? Was it something you worked towards, or did it just happen? It all began when I was a student at Oxford, when I realised my maths degree probably wasn’t going to help me meet my idol Ella Fitzgerald. Sadly Ella died just a few weeks after I’d made the career change, but it was too late by that point, chances of a top job in the city had gone, so I pressed on in a bitter rage. ‘No time to muck about’, that was my Uncle’s motto. You’ve appeared on numerous television shows in the UK. What’s it like working for TV? It’s awful. You start doing a jigsaw in the dressing room and someone fiddles with it. You buy a cake and someone bins it. Theatricals everywhere padding you in make-up, men wearing hats, women walking around saying things, it’s a bit much really. You’re quite active on Twitter. What is it about the social networking site that you enjoy? I like Twittarse because I can look at who my connoisseurs are by gazing at miniature versions of their beautiful faces. It’s good for keeping in touch with showbizness people too, like my comedy wife Fearne Cotton. It also takes away the deep loneliness that is constantly charging through my veins. 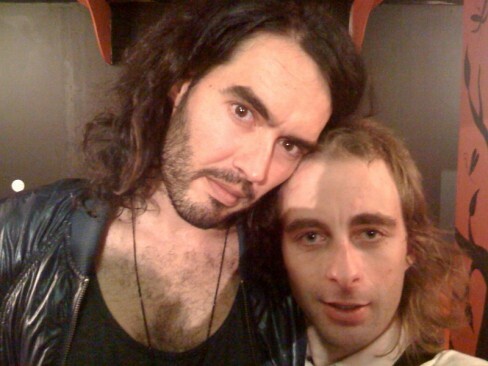 You’ve worked with Russell Brand and he claims you’ve made quite the influence on his career. What’s Russell like? Do you like collaborating with other comedians? Russell is a very talented and magnetic man, he was so ambitious and dedicated from the start that ’twas obvious he was going to be utterly famous one day. I do like collaborating with other comedians, of course. Noel Fielding, Brian Gittins, Dan Clark and Dionne Warwick are some of my favourites. I think so, but what with the disgraceful mess of Britain’s train network these days, you never know. What are your thoughts on Australia? Can you make any observations on Australian culture? The people are much more relaxed here. In London everyone is out for themselves, they leave the fridge door open and rush out into the night screaming. Whereas in Australia people aren’t so bothered about welfare, politics, or financial security, they just slap a few meat shavings on the grill and GET ON WITH IT BABY. From Mr Paul Foot, Life President of the Guild of Paul Foot Connoisseurs. Paul Foot is currently performing his show ‘Ash In The Attic’ at the Melbourne International Comedy Festival. For show times and further information, click here. → His and Hers. All Stars.